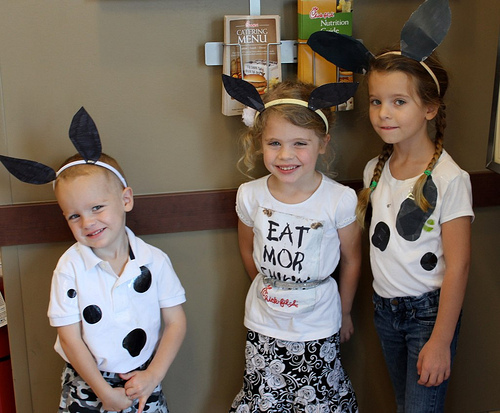 The kids had so much fun planning out and dressing up in their cow costumes for Chick-fil-A’s Cow Appreciation Day today. We used stuff we already had on hand and I was really happy with how their costumes turned out. Kaitlynn didn’t want to use one of the tails I printed out from Chick-fil-A’s website, so she made her own! I think the kids had the most fun seeing all of the crazy costumes other people had concocted. I had told them ahead of time that probably other people would dress up, too, but I guess they didn’t quite believe me until they got out of the van and saw all of the cow-decked people headed inside. They kept laughing at the hilarious things people had come up with — and, let me tell you, there were some doozies! I couldn’t believe how many teenage boys and grown men dressed from head-to-toe like cows. Some of them looked like they had put a whole lot of effort into their costumes and seemed not a bit embarrassed about wearing them for all to see! We arrived at 11 a.m. and I’m so glad we did, since we were able to get a table back in the corner away from all of the throngs of people. Plus, we didn’t have to wait in a line that stretched out the door! Some dear friends of ours who currently live in India but are back in the states for a few weeks met us there and we enjoyed getting to catch up and visit for awhile while the children played. All in all, it was a wonderful experience — and definitely something we’ll be doing again! Did you do something fun and frugal as a family today? If you blogged about it, I’d love for you to leave a link to your blog post below. Or, you can just tell us what you did in the comments. Note: Since the purpose of this series is to encourage you to be intentional about fun in your home this summer, please only link up posts showing pictures/sharing details of fun things you did as a family today (or within the last few days). Posts that do not adhere to these guidelines will be deleted in order to make it fair for those who are putting forth a lot of effort to participate in this challenge. Looking for more? 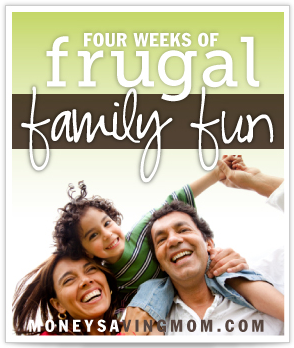 Read more posts about 4 Weeks of Frugal Family Fun. You did a great job Crystal. I was wondering what kind of costumes you’d make for your children after seeing your post on Facebook this morning. LOVE IT. Great job. Did you dress up too? We had a great time dressing up too! We took black or white clothes that we already had, cut out construction paper spots and used masking tape to put them on. We’d gotten the cow hats that Chick Fil A was giving out earlier in the week so we didn’t have to worry about ears/faces. We used more construction paper to make tails and taped them on. I totally agree about the grown men in full-out costumes! I loved seeing the babies, that obviously weren’t going to be eating food, but that the moms had colored black spots onto their onesies. One cute idea I saw was to take an old white shirt and cut the spots out, then put it on over a black shirt or tank top. My kids loved their free lunch, getting to see the cows, getting balloons and just seeing everyone that was dressed up. Capped it off with some free ice cream since we’ve been enough times to already have all the Little Critter books so we turned them back in for ice cream cones. Is that normal policy to trade the book for free ice cream? It is, we do it all the time. Yes, it’s great, especially when the prizes aren’t anything you want/need. This time around we’ve enjoyed the Little Critter books but we only need one of each so it’s nice to be able to get ice cream. I told someone in the restaurant about it today and she was really excited to learn about it too! They also always give free refills on drinks. We loved dressing up! My kids enjoyed going out it public in costume so much!!! We took a picnic to a carillon concert. My son then biked and we played at the play ground. Our Whole Foods had Organic cherries for $1.99 so I stocked up. We all dressed up. I made costumes for my sons and myself out of things we had around the house. My husband has a cow Halloween costume and wore that. He was the biggest hit. The staff actually applauded him when we walked in. He is such a ham that he loved all the attention. My boys loved playing with the other kids and we all just had a great time. We don’t eat out often and I was surprised by how much I really enjoyed my meal. I have so much more fun now that I am frugal. It is our fifth year participating and we wouldn’t miss it for anything! Love the creativity of people and the generosity of Chic fil A! We did Chick-fil-A today, too. Great times!!! After we got home, our five year old rode his bike while daddy helped our 3 year old figure out how to make her bike go; I pushed the baby in the stroller to “work off” my dinner (still working on losing the baby weight!). Great family time!!! I can’t believe how grown up Kathrynne looks!! Kaitlynn looks JUST like you, and Silas definitely isn’t a baby anymore! Thanks for sharing! We actually ended up at Chick-Fil-A for lunch, too, but we weren’t prepared with costumes. We saw some great looking cows though! How fun! 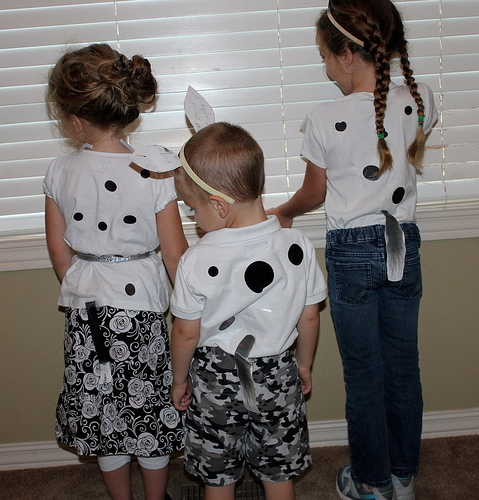 Your kids costumes look really cute! Love it!! 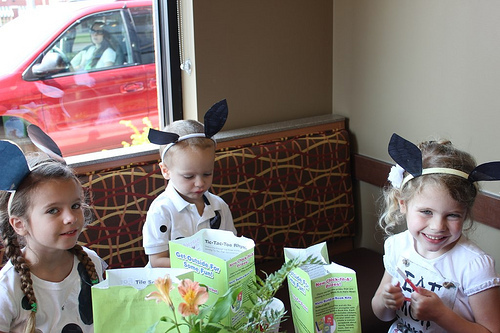 Those cow costumes are too stinkin’ cute! Our “Princess Play Dough” turned out really nice! We also used your “Long Jump Contest” idea and loved it!! The whole family had a great time, although it seems that people in this area of PA were not as enthusiastic about the event. Too selfconscious maybe? My 3 and 4 yr old had a blast. My husband, kids and I all dressed up. We also got our free Starbucks and lotion at Bath and body works. Lucky for us everything is so close here in Southern California. 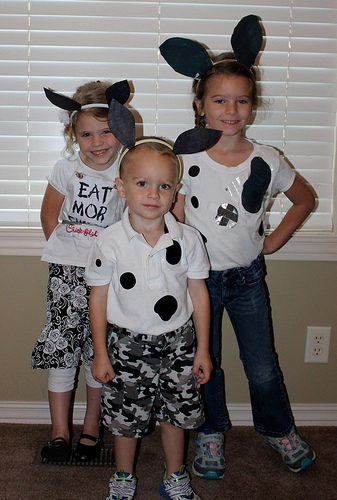 Using our cow costumes from year to year saves money, energy, and time. The initial investment of about 2 hours was worth every second. We saved the hats from a Kidgits Event for kids and use them each year. Easy peasy for free food! Your kids look really cute in their costumes. We made some raspberry jam. The kids did almost everything themselves and did a great job. Didn’t do free chic fil a, but still had fun. We went over to my friends house. She’s alo my coworker and since we are teachers I haven’t seen her since school let out. My hubby is going to redo her deck and build some stairs. He discussed that with her husband, she and I chatted and our kids jumped on her trampoline….and it was lightly raining. So the boys got to play in the rain and jump! Best of both worlds!! So wish we had a Chick-fil-A here! It’s our favorite fast food restaurant! Your mention of full grown men dressed as cows reminds me of what I have experience both time I have run the Indy500 half marathon. Whenever I enter the Indy 500 race track where you run 1 lap around it, I see all sorts of grown men pretending to be race car drivers with their imaginary steering wheels in their hands making car noises as they run! I do best to let them enjoy their moment but still I have to bite my tongue not to burst out laughing. Oh my goodness they look adorable! Haha, if only we had a Chick-fil-A close to us! I can’t guarantee I would have dressed up, but I know my husband would have in a heartbeat! Thanks so much for sharing this. The photos are absolutely adorable. I have been very curious about this event, but too “chicken” to attend. Now I see what fun my family can enjoy! Crystal, your children are soooo adorable!! I really enjoy seeing all the pics you post of them. Thanks so much for sharing! Copying here: “I can’t believe how grown up Kathrynne looks!! Kaitlynn looks JUST like you, and Silas definitely isn’t a baby anymore!” Exactly!!! I’ve been noticing this for a while now and thinking the exact same thing. We 4 senior citizens (2 sets of grandparents for the same 3 teenagers) dressed up and drove into a big city to participate in Cow Appreciation Day. It was our 4th time at least and we do save our costumes. It was the other grandparents’ 1st time and they were great sports. We have 4 brass bells so we all wore cow bells too and rang them when we walked in. We also went at 11:00 and it was sure a good thing we did. Afterwards we headed for Starbucks to try the free Refreshers. We finished off our fun and frugal day by going to a state park here that has the most unusual playground-type area for kids. It’s especially made for kids who can’t see, with braille information and hands-on exhibits of animals, etc. There’s a beautiful array of unusual playground equipment with cushioned flooring. But the icing on the cake is a 7-station walking path that tells the story of Narnia and has a wardrobe to walk through with fur coats hanging on either side. Each station had something quite large to feel–Mr. Tumnus’ cave, the stone table and next the table cracked, etc. It was amazing. The whole thing was free. No admission charge to the state park even. Wow, where is that park located? That sounds so cool! It’s Warriors’ Path State Park in Kingsport, TN . I just looked it up online and the Narnia trail had 8 stations, not 7. Darrell’s Dream Boundless Playground is the playground’s name. I didn’t even mention the huge treehouse that you can walk into, but is well above-ground on the other side. Just do a search and it will come right up. Can’t wait to have our grandkids here again and show it to them. saving money is the game to play…3 kids and another on the way…virginia beach va…love this place…always having free things to do..not to mention the great beach that always have people there to give u a show….my moment of the weekend is the Chrysler Museum it was free this Saturday….every 4th saturday of the month they have family free day…it was great..this time we had ice cream from the people who made the first ice cream cone…so good. Thanks for the heads up on this deal. My preschooler, toddler, and I dressed up. We used black eye shadow to make spots on our faces! Our Chick-Fil-A had a guy making balloon animals for all the kids which was awesome. Then when we left, I drove to the next closest Chick-Fil-A which was only about 10 minutes away and we got daddy dinner to go. I ended up getting about $34.00 worth of food for free! I can see why they do this too, because I’d like to start going there more often. They have such a fun and friendly atmosphere. The employees are so nice there too, not like other restaurants where you can tell they don’t want to be working at all.